Services provided by the Social Learning Center, LLC are not covered by insurance. Why do a group with the SLC? We have been providing social groups to central CT for the past 10 years. Chris is recognized as a leader in the field of social interventions and ASD and supervises all groups taking place at the SLC. We pride ourselves in embedding social learning within real life, meaningful experiences and interventions. Don’t take our word for it! Read other’ experiences with Chris and the SLC by clicking here. 2019 Winter Groups are here! Click and learn more about what we have going on. Please share with others!!! $980/ 14 weeks — Our Social Cognitive Groups are the cornerstone of the SLC. You will find low client/ clinician ratio, strong foundation in Social Thinking methodology (www.socialthinking.com), community based outings, and a strong parent involvement. We run both a Fall and Winter semester for 14 weeks each. A shorter Spring semester can be provided if there is interest. Social skills are those static social behaviors we engage in when in the presence of others. Some examples of social skills are greetings, holding the door open for others, not getting to close to someone whom we just met, etc. Here at the SLC, we run what we call “social cognitive groups”. Social cognition is all about the thinking that goes into us preforming those social skills; why do we do those things people have taught us to do. It involves perspective taking, executive functioning, gestalt processing, emotional recognition and regulation, and social pragmatics. As written about by the Center’s friend and mentor to Chris, Michelle Winner talked about addressing social development from it’s “roots”, and that is what makes us here at the SLC different from other providers. Mr. Abildgaard is personally involved with all the groups taking place at the SLC and provides ongoing training and supervision of the entire staff. Participants will learn new social concepts, practice those concepts and social behaviors, be given on-the- spot feedback, and will identify with others who struggle with navigating the social world. All participants are matched on their cognitive and language based abilities, not just chronological age. You will not find large variability in the functioning levels of our participants as it would impact the efficacy of our program. Collaborative Play Groups: This social cognitive group is geared toward younger clients ages 4-6. The focus in this group will be working on sharing physical space with others, collaborative play, developing one's imagination, joint attention skills, verbal problem solving abilities, and developmentally appropriate emotional regulation skills. Many of the concepts and activities will follow or have been adapted from the Social Thinking curriculum "We Thinkers” (www.socialthinking.comg/Products/WeThinkersVolume2DeluxePackage). Social Cognitive Groups: Elementary - Adolescents. The focus of these groups will be created based on the needs of the individuals. 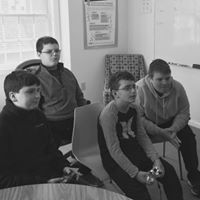 Concepts like relationship development, emotional regulation, anxiety strategies, social media, verbal and non-verbal communication, and how our social executive functioning skills all interplay with our social success can all be topics the groups explore. Social groups are carefully planned and put together based on the individual needs of the clients, not just age or grade. Young Adult Classes/Groups: Ages 17 and over. Focus on a general theme or concept that is related to the social world they are encountering (work, higher education, relationships, driving, etc.). Group Intake $150/hour — This will last 1 hour and will be used to help identify individual social strengths and one’s lagging social competencies to be addressed through our group. During the start of each new group session Chris will be conducting the intake. After registration has closed, Erica will be running intakes when she has availability. To set up an intake for a Social Cognitive Group please click here and complete the intake form. $160/hour — All school based meetings and observations are done by Chris Abildgaard. 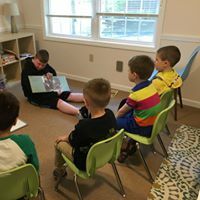 Chris has been consulting in Connecticut school systems for the past 10 years. Chris brings a very unique perspective to school based consultation. His lens for viewing a student's needs is shaped by his strong background in social cognitive development, executive functioning and mental health interventions. If you are interested in having Chris assist you with your son’s/daughter’s educational program, please email Erica to set up an initial intake and consultation meeting with Chris. $200/hour, payment plans available — Each assessment is designed to answer specific referral questions asked by the family or school district. Our evaluations are done using a team approach of the professionals here at the SLC. The Social Learning Center, LLC. can provide several different types of evaluations depending on on the need or referral questions. Types of evaluations offered include: comprehensive psycho educational, diagnostic evaluation, and social cognitive evaluation. Please contact Chris directly if you are interested in learning more about the full evaluation process.